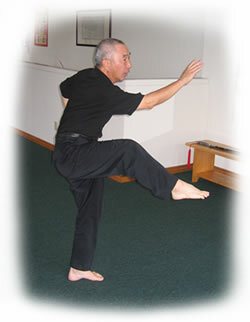 A Northern Shaolin kicking form originally practised by the Chinese Muslims in North-Western China. This program teaches children and young adults to be courageous, loyal and disciplined. The form consists of 12 segments with each segment having it's own unique emphasis and applications. Students will learn the basic stretching exercises, various punches, palms and kicks. The intensive workout throughout the program will result in increased flexibility and stamina. Martial art applications for each segment will be mentioned but not emphasized. Good moral discipline and endurance will be maintained throughout.